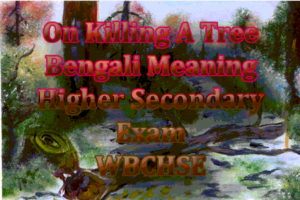 Read On Killing a Tree Bengali Meaning for Higher Secondary English Exam Preparation. This Higher Secondary Exam Study Notes will help you surely. On Killing a Tree by Gieve Patel. Text, Bengali Meaning, Word Notes of the Poem ‘On Killing a Tree‘. But this alone won’t do it. Not so much pain will do it. For years inside the earth. And then it is done.